Wow, wasn’t that a fun-filled meeting that we had last night! What can go wrong went wrong last night! Firstly, Kwa Ngan Eng, DTM, our regular refreshment organiser forgot that yesterday was Wednesday and did not order our trademark “nasi lemak” and President Jeannie, CC bought some “nasi lemak” from another source which was not up to our expectations. Now, we know and appreciate how tasty our usual “nasi lemak” is! Then the holders of our cabinet key are all overseas or unable to attend the meeting which caused a flurry until Kwa Ngan Eng, DTM discovered an old key which miraculously opened the cabinet which allowed us to retrieve all our stationery at last. What a relief! However, the meeting ran smoothly without any further hitches as TME, Pun Yew Kee called the meeting to order at 7.15pm. Kudos, Yew Kee! We also hereby welcomed and thanked General Evaluator, Lee Ying Ying, CC from Sunway Toastmasters Club, guests, Rick Molin and Lai Yoong Hean, CC also from Sunway Toastmasters Club for being with us. President, Jeannie, CC reiterated the slogan for our term 201-2015, “Efficient, Effective, Excellent” by punning on the theme of the meeting and encouraged all to be persistent in order to overcome all obstacles. Thank you, Jeannie! Grammarian, Yousuf, CC gave the meaning of the word of the day “persistent” and also provided an example on how to use it. Great work, Yousuf! President, Jeannie, CC gave a soulful invocation speech on a father and his three sons which was very attention-grabbing. She also advised us to let go of things, for whatever belongs to us shall return to us and it will be difficult to hold on to whatever that will not stay with us. Well said, Jeannie! 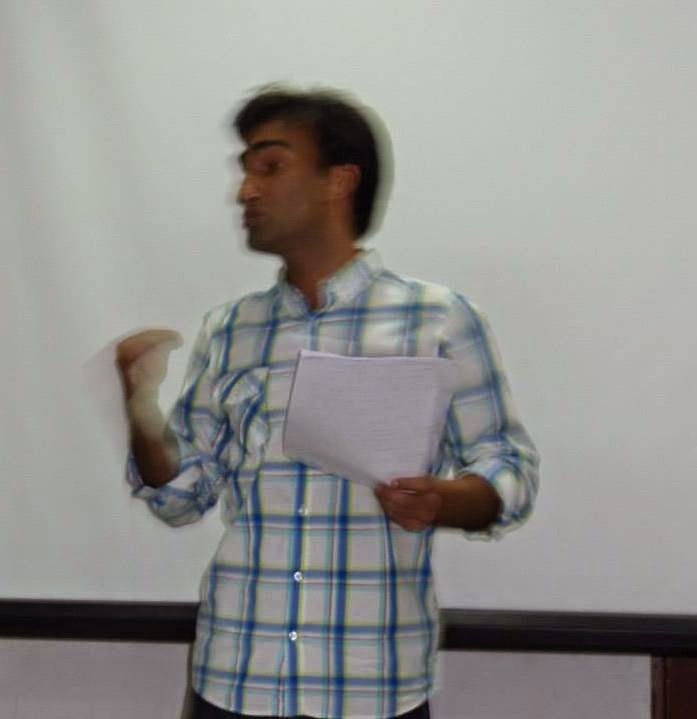 Table Topics Master, Kooshan conducted the impromptu speech session with extraordinarily brain-racking titles which set everybody’s adrenalin pumping. However, the volunteers, Pei San, Rick Molin, PY Wong, ACB and Lai Yoong Hean, CC were very sporting and took up the challenges. 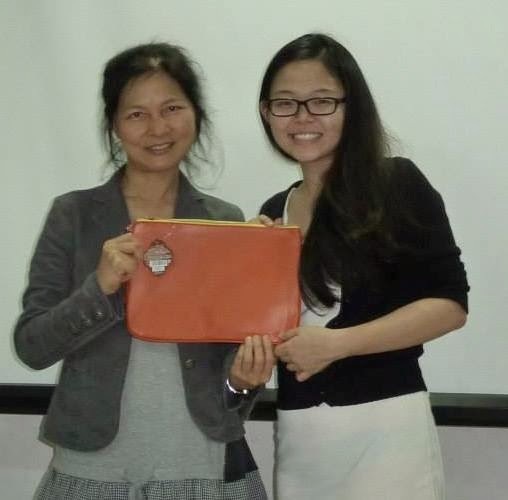 And the best Table Topics speaker went to PY Wong, ACB. Congratulations, PY! Humour Master, Jeannie, CC entertained us with her hilarious story of a 90-year old couple who encountered Genie in a bottle and their wishes. You are a real joker, Jeannie! Table Topics evaluator, Shirley Bak, DTM gave a thorough evaluation of all the Table Topics speakers and all were motivated to volunteer for future impromptu speeches, again. Good job, Shirley! After a break of ten minutes, the meeting resumed with the project speeches session. PY Wong, ACB presented a speech from the Advanced Manual #5-Communicating on Video about zero food wastage which was very informative and well-researched. Well done, PY! He was evaluated by a panel of evaluators, General Evaluator, Lee Ying Ying, CC, Lai Yoong Hean, CC and Shirley Bak, DTM. Thank you, evaluators! 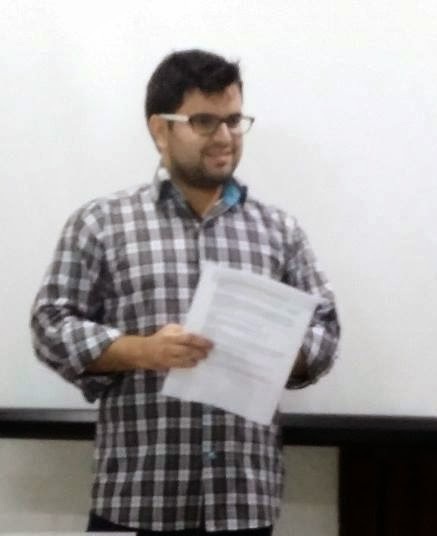 Secondly, Yousuf, CC presented a speech from Advanced Manual Storytelling #2 about his trip to Langkawi which was very thrilling and exciting and everybody felt that they were soaring through the air with Yousuf on his parachute. Well done, Yousuf! Yousuf was evaluated by Kwa Ngan Eng, DTM who was very absorbed in his story telling and satisfied with his presentation. Thank you, Ngan Eng! The final speaker, Jeannie, CC presented a play, “As Others See Us” from Advanced Manual, Interpretive Reading #4 which was very lively and interesting. Well done, Jeannie! She was evaluated by Yousuf, CC who gave a very comprehensive and detailed evaluation which was very constructive. Thank you, Yousuf! 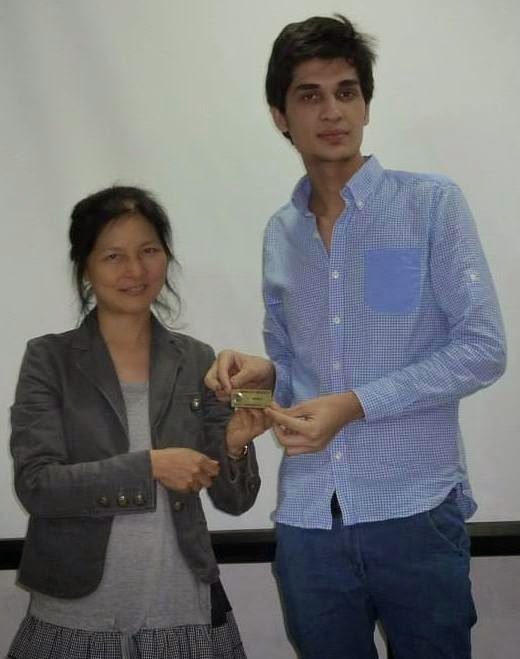 The best Project Speech Speaker and the best Evaluator went to Yousuf, CC. Double congratulations, Yousuf! The Ah Counter, Kwa Ngan Eng, DTM reported concisely on all the word crutches used by the speakers during the meeting which alerted all of us to be more careful in future meetings. Thank you, Ngan Eng! Grammarian, Yousuf, CC was very attentive and was able to capture those who used the word of the day in their speeches, all wrongful usage of words and sentences and also creative usage of words and sentences. Awesome, Yousuf, for he took on so many roles yesterday! Pei San, first time Timer did very well by meticulously recording and reporting on the timing of the whole meeting. Very well done, Pei San! The Listening Evaluator, Obaidullah stirred a storm when he gave questions within questions which baffled and stimulated all our brains. Good job, Obaid! 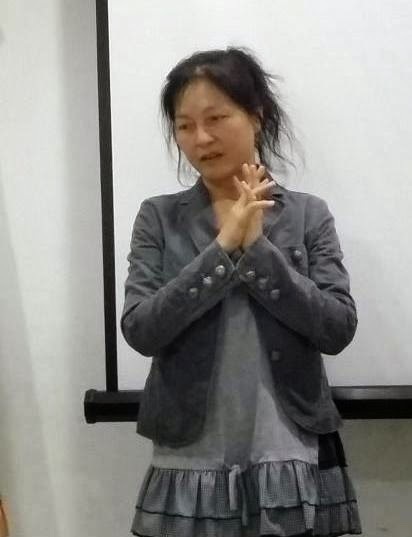 Our General Evaluator, Lee Ying Ying, CC was very genial and detailed in her report and we will definitely welcome her again to our future meetings as our General Evaluator. Thank you, Ying, Ying! 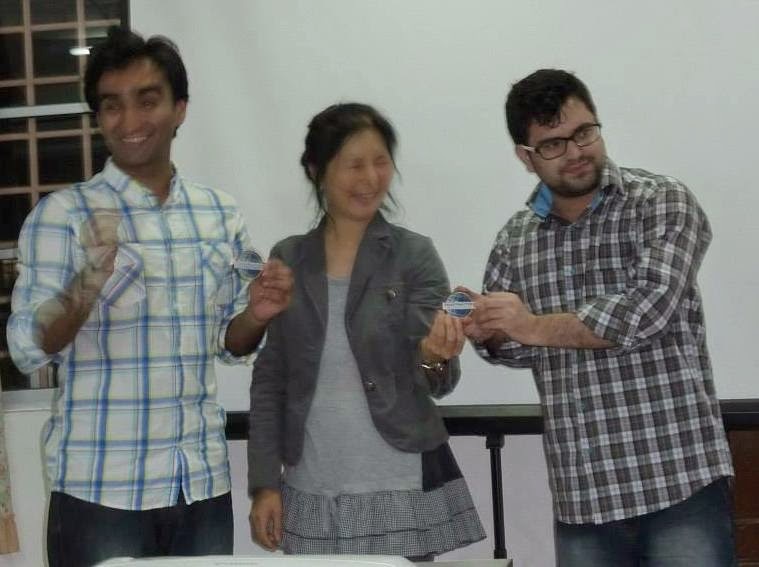 The meeting ended with President, Jeannie, CC presenting the membership badges to Kooshan and Obaidullah and Toastmasters International magnetic mementoes to Kooshan and Yousuf, CC for they will be returning to their homeland, Afghanistan at the end of this month! Farewell, Kooshan and Yousuf! Bon voyage!! With that, our meeting ended. Goodnight! Extol Toastmasters Club is conducting a 3-day YOUTH LEADERSHIP PROGRAMME workshop in communication and leadership for youths from 12+ to 18 years old. This workshop is effective in giving youths a head start in their communication and leadership skills in preparation for their future. Youths in the age group of 12+ - 18 years can participate in the programme. This programme is limited to 30 people. This allows each participant to receive individual attention and the opportunity to get practical experience. The programme is normally conducted during the long school break in November each year. It will be conducted for three days continuously from Friday to Sunday. Venue: Wisma CNS, 2-6 Jalan SS 19/1G, 47600 Subang Jaya. A ten percent discount per participant will be given for group enrollment of more than 3 participants. 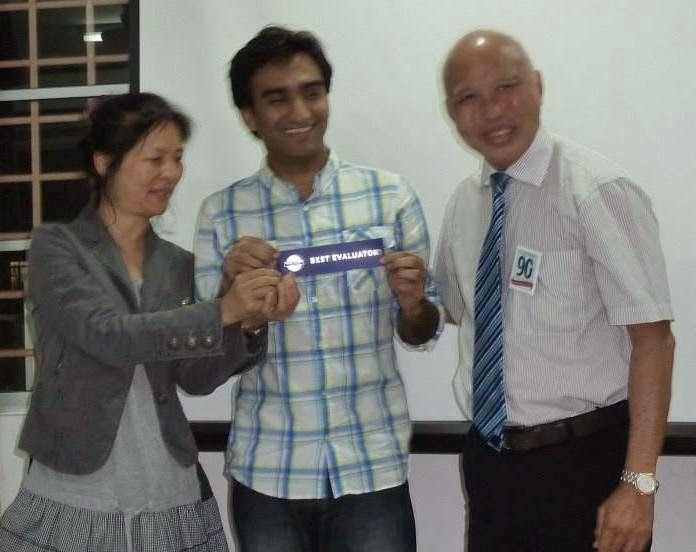 We had an overwhelmingly “Once in a blue moon” first joint meeting of our term 2014-2015 with Sime Darby Healthcare Toastmasters Club yesterday. However, the Word of the Day “Consistent” was most apt as all members present including the joint club members quickly organised the room for the meeting. Thank you, everybody! This proves right the slogan for our term, “Efficient, Effective, Excellent”. The meeting started a bit late due to late comers deterred by heavy rain and the massive traffic congestion. It was 7.15pm when ASA, SK Ratnam, DTM called the meeting to order. President, Jeannie Carrera, CC gave a very warm welcome to everybody, the joint club members, the guests and General Evaluator. Ivan Chow, CC who had all arrived early for the meeting despite the weather and traffic chaos outside which really lifted everybody’s spirits. Thank you, Jeannie! TME, Mohamad Yousuf, CC immediately took over the reins and conducted the meeting in his usual professional, confident, trademark manner. Kudos, best TME Yousuf! 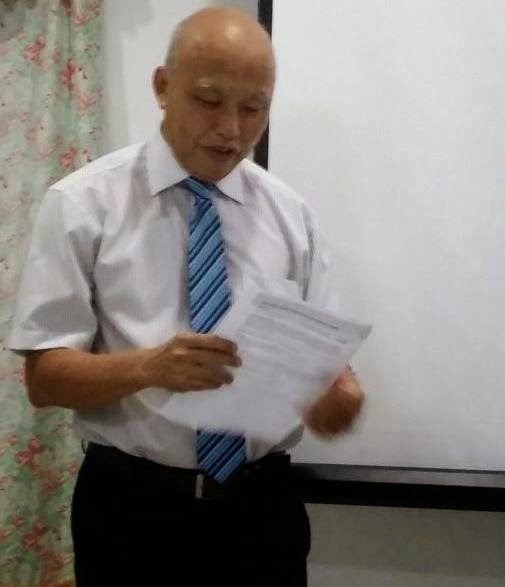 Dr. KP Ng from Sime Darby Healthcare Toastmasters Club, the Grammarian introduced the Word of the Day “Consistent”, explained its meaning and gave an example for it. Thank you, Dr. KP Ng! Invocation Master, Kwa Ngan Eng, DTM shared an inspiring story of the farmer and the rabbit by applying both the Theme of the Meeting and the Word of The Day which cautioned us to continuously work hard to attain success in our lives instead of waiting for miracles. Thank you for your advice, Ngan Eng! For the impromptu speech Session, Table Topics Master, Pun Yew Kee gave topics based on normal, everyday events which attracted our guests, Victor and Pei San to participate. Kwa Ngan Eng, DTM, Ken Koh, CC and Jewin Kumar, CC also volunteered as Table Topics speakers. The best Table Topics Speaker went to Ken Koh, CC. Congratulations, Ken! SK Ratnam, DTM, the Humour Master of the meeting broke the norm and gave us numerous subtle sayings about the relationships between men and women which set everybody smiling. Thank you, King of jokes, SK! After the break of 10minutes, our meeting resumed with the Project Speech session. The first speaker, PY Wong, ACB presented an advanced manual speech on “Communicating on Video” which was titled, “Zero Food Waste” which was very informative and eye-opening for lucky city folks like us who have yet to experience real hunger pangs. Well, done, PY! PY was evaluated by SK Ratnam, DTM, Thank you, SK! 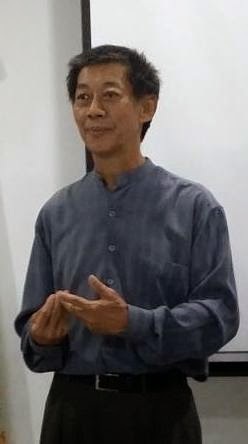 The second speaker, Ken Koh, CC also did an advanced manual speech on “Interpretive Reading”, a monodrama of a very touching and moving autobiography of how an Asian child was raised. Well done, Ken! Ken was evaluated by Shirley Bak, DTM. Thank you, Shirley! The third and last speaker, Jeannie, CC similarly did an advanced manual speech and presented a toast to Mohamad Yousuf, CC for his brilliant Toastmasters career and farewell as Yousuf will be returning to his homeland end of this month. Well done, Jeannie! Jeannie was evaluated by Kwa Ngan Eng, DTM. Thank you, Ngan Eng! Two speakers went overtime, therefore there was no voting for the Best Speaker, however the Best Evaluator went to Kwa Ngan Eng, DTM. Congratulations, Ngan Eng! 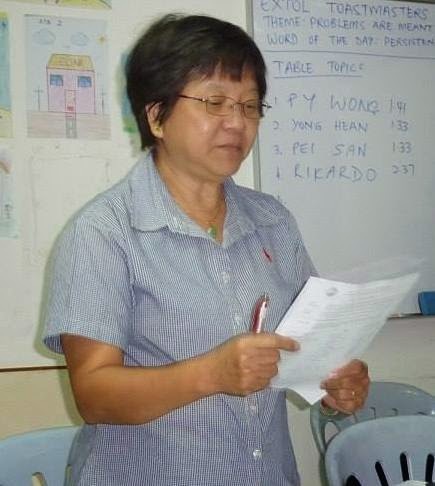 The Grammarian report by Dr KP Ng was very precise, well-structured and she captured many of the good language usage and catchy phrases. However, she lamented that nobody used the Word of the Day but the Theme of the Meeting was overpoweringly used. Thank you, Dr KP Ng for your keen observation! The Ah Counter, Ler Kiat See also from Sime Darby Healthcare Toastmasters Club gave a detailed report on the word crutches used during the meeting and we noticed that few have word crutches. That is an improvement. Thank you, Ler Kiat See! Jewin Kumar, the Listening Evaluator was very attentive and nobody was able to answer all the ten questions that he asked. The best attempt was five correct answers. Well done, Jewin! Buck up, everybody and grab the Best Listener Award next time! 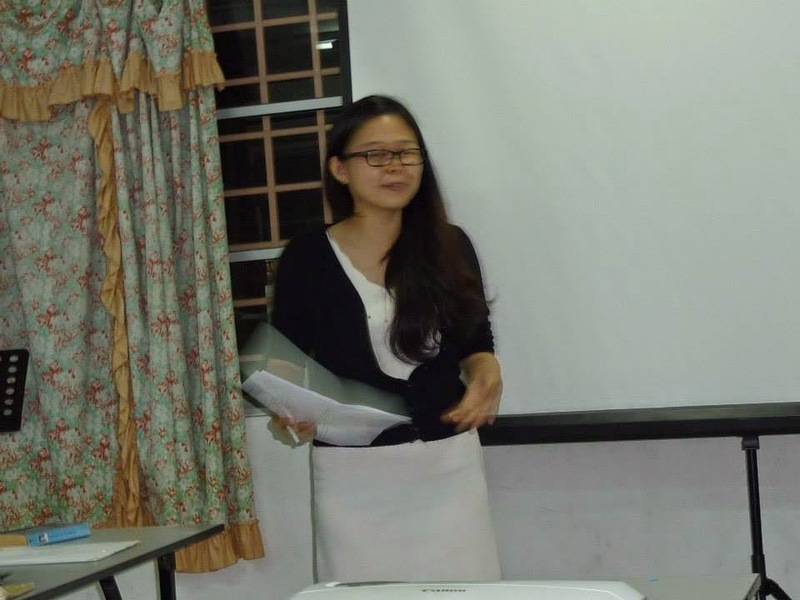 Irene Tin Leh Hun, the Timer, also from Sime Darby Healthcare Toastmasters Club gave an in-depth report on the timing of the whole meeting and for each speaker and role player. Well done, first time Timer, Irene! The General Evaluator, Ivan Chow, CC from Sunway Toastmasters Club offered a very forthright and encouraging report of the whole meeting and also on the speakers and role players. Thank you Ivan! We definitely will welcome you again as our General Evaluator for our future meetings. 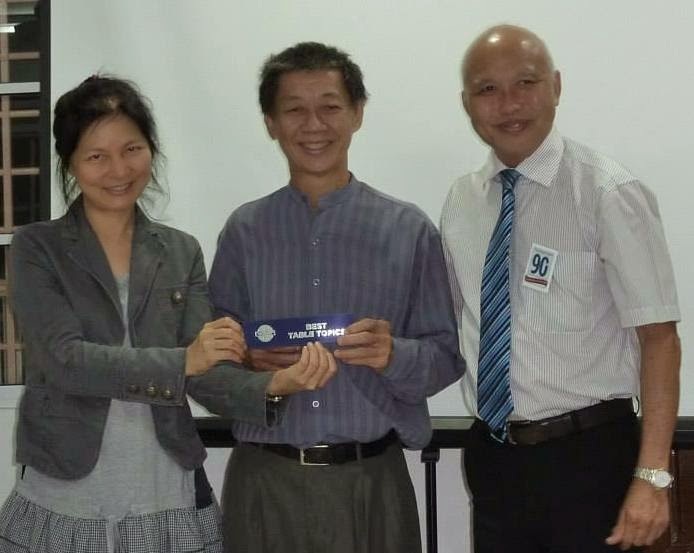 Immediate Past President, Pun Yew Kee thanked all our club members who had helped our club to achieve Select Distinguished Club status for the term 2013-2014 by displaying the plaque and the sash. Well done, Yew Kee and his team! He also hoped that our club will attain President Distinguished Club status for the term 2014-2015. Come on, let’s buck up and make this come true! 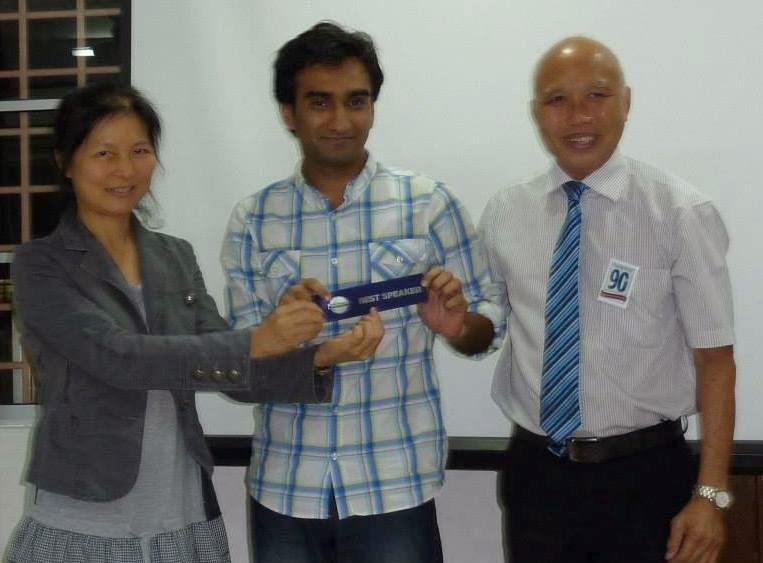 After this, PY Wong, ACB performed an induction ceremony for new members, Mohamad Yousuf, CC and Jeannie Carrera, CC. Thank you, PY! 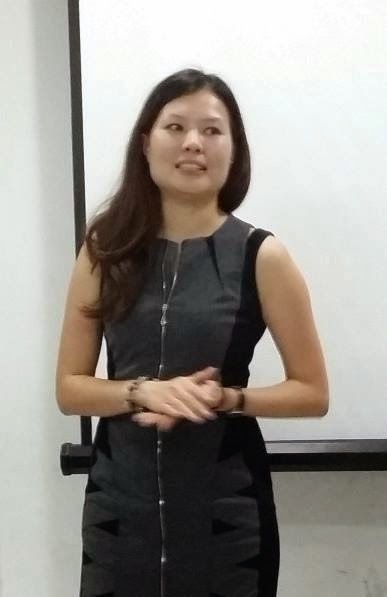 President, Jeannie, CC closed the meeting by reiterating on the Theme of the Meeting and the Word of the Day which though controversial was actually very appropriate in order for all to advance as Toastmasters members. Let us not wait for the blue moon but always be consistent in whatever we do! The meeting ended at 9.30pm. Good night, everyone!